Medieval Castle Blog: A Haunted Castle For TV's "Most Haunted"
It's October again with Halloween just around the corner. So we're going to discuss all things 'spooky' this month on our Medieval Castle Blog. From legends to true, live witness accounts we've got some great medieval castle ghost stories to share with you! First we will look at Carlisle Castle - a fabulous piece of medieval castle architecture in Britain in the county of Cumbria. With no less than 900 years of history to its name, Carlisle Castle has seen some truly turbulent times and has associations with many famous people. These include King David I (King of the Scots) who died there, William Wallace who once tried to attack the castle, Mary Queen of Scots who was imprisoned there for a time at the behest of Queen Elizabeth I, Bonnie Prince Charlie who also attacked the castle, and, in the 20th century, Rudolf Hess who during WW2 made an overnight stop at the castle on his way South having been taken prisoner in Scotland where he landed his plane. One can well imagine the intensity of some of those historic visits! It's not surprising then that Carlisle Castle is rumoured to be haunted. So much so that the TV series "Most Haunted" visited the castle this summer to film one of their shows (due to be aired some time this month). The shows producers are giving little away but have admitted during their stay, the team experienced mysterious footsteps in the gatehouse, strange phenomena in the Keep and something very unusual around one of the cherry trees in the castle's grounds. If you think it might not be genuine, think again ... staff at the castle have reported seeing mysterious figures on many occasions, especially on the top floor of the Keep. 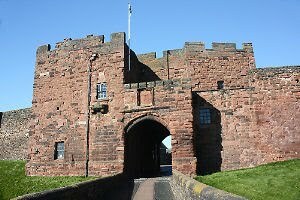 Having visited Carlisle Castle myself I can honestly say that it has an intense atmosphere about it. The dungeons are particularly eery. See our photographs of the castle dungeons and you will know what I mean!